I guess its no more, but whats impressive is the gang of people who came out from there. Anyone agrees or not, today the internet domain and the a lot of other technology sector is powered by these individuals. Example the two local ISP's. Even if we look at blogging itself for Maldives, was started from the same place. It was mostly play, but that platform gave a lot of individuals a common ground to share knowledge and experience a lot of stuff. The point to be taken is, this sort of platforms gives birth to a lot of good stuff. Its unfortunate that there are no such places now. It was fortunate back then, such a place existed. A lot of people saw it as a waste of time, but if you ask the same question today, the answer might be very different. People who learned to setup a server and manage the cafe's traffic, are the people who manage your internet today. Its not just the physical place. The key factors which contributed to this, might have been the available resources, and the group of individuals who had the same common interest. Sharing knowledge and trying out new stuff (which was deemed useless and kiddy) has resulted in a lot of good. We've experienced guys who started off configuring BNC's and bots now working as developers and writing commercial applications. Guys who were gamers now web masters and system administrators. I've always thought that the education system here in Maldives, is only targeted to produce quantity not quality. You just give them sheets with questions and answers and ask them to memorize them. Its does not matter if they understand them or not, as long as they are able to answer those questions; thats what we currently define as good education. The paper qualification is what the parents and the society expects, not the skills, talent or the knowledge that students have. Its a very difficult topic and will be out of the context of my main interest. I've had experience a few years back teaching computing for school kids. It was a good experience and one I enjoyed. The syllabus back then encouraged students to develop really good IT skills in a wide area. The basics was covered with some good practicals. Programming was a must, as it should be since the subject was computing. The problem back then was, the lack of good teachers (the government employed cheap labor and no proper planning was there) and hardware and other resources. These were just some of the problems, then around the year 2000, Min. of Education decided to lower the standards (the result was good politically, as more students would manage to pass and some manage to get outstanding results). The new syllabus was really weak compared to the older one. It is not the right type of foundation for IT. This has been proven over the last few years. The same trend has been moving on, even at the higher education level. Even at the FMC (I think its faculty of management and computing) there is no proper standards. The main objective is to provide students with paper qualification not to improve and develop the skills of the students. At the foundation level Visual Basic is the primary language. This alone shows level of quality in the program. To sum up, the fact that we have such a hard time employing skilled IT professionals alone proves the above points. The fact that Indians and Sri Lankan companies are employed to develop our applications and design and maintain our networks and hardware are more then enough proof. Its sad to know that this is the case, and no proper action is taken or this is ever talked about. But then over the last few years I also have come to accept that these won't change any time sooner. There simply is no awareness at all. Anyway the most profitable business in the country presently is politics and the leaders (ultimately the business men) are too busy doing business rather then focusing on issues such as education, health or future of our economy. While Apples iPhone is gonna be out next month, the news is that Microsoft is coming up with there version of a phone called the 'oPhone' or do they call it 'oFone'?. There is a video about it saying how incredible it is going to be and people are going to say “O” when they see the phone. Good Prank, I guess. Anyway here is the video. Darth Vader on the way to lead the republic? Everyone knows Darth Vader, if you are a Star Wars fan. So where does he fit into? A bad guy (Sith) or a true Jedi? Its controversial. Some feel he joined the dark side, for good causes others feel he joined the dark side for his own hunger of power (its said, Wader's motivation was originally a need to restore order rather than take power). The other view is; is the dark side really wrong? If you come to think about it, Qasim Ibrahim's story is no different. There is an interesting post at Mohamed Nasheeds Blog which made me really wonder and think into the history of past few years. I think Mr. Qasim is on his way becoming the maybe the next president of Maldives. Its highly possible. Today seems he is elected Chair of Peoples Special Majlis. No surprise though. My view on the results is either the army will take over the country or Mr. Qasim will be the next president. Sorry MDP (You guys don't stand a chance, from how you have displayed so far). Its interesting to note the following from Nasheeds blog. Nop, no need to die to get there. Just download the client and sign in. 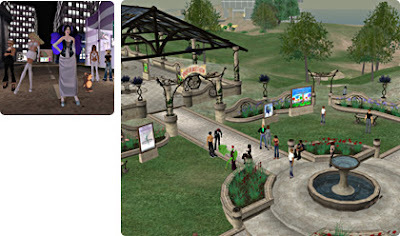 Second Life is a 3-D virtual world entirely built and owned by its residents. Since opening to the public in 2003, it has grown explosively and today is inhabited by a total of 6,085,300 people from around the globe. Second Life is considered to be the best Virtual World developed. Though the concept is more like an online game, it does not actually reflect that model totally. In Second Life, you can buy and even build stuff, but for me the idea of spending money on virtual stuff did not click very much. You could even buy or sell land or build a house or run a business there. The idea is not so bad, after all you have some 6,086,003 users. Anyway... I got bored very quickly with SL. The objective is mostly to buy and sell stuff... or be bored. Maybe not, just give it a try and see, some people might like it. 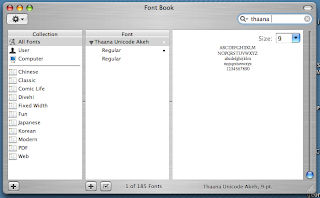 First download and install the Thaana unicode fonts. In my case I always prefer "Thaana Unicode Akeh", which is a free font developed by MITF and considered to be the first Unicode thaana font. 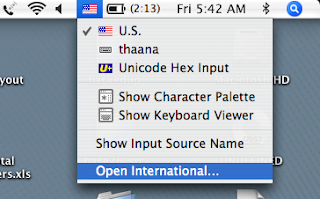 Next you will need to download Ukelele, which is a Unicode Keyboard Layout editor for Mac OS X. Get the application installed and execute it. Its very straightforward to be used. Character Palette can be a lot of use when editing the keyboard layout. You might refer to MSCT for reference when creating the layout. 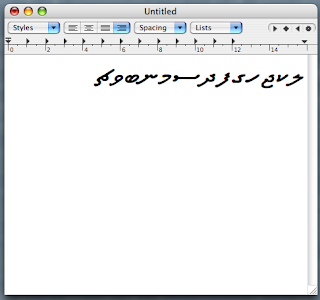 After you are done creating the layout, save the file as thaana.keylayout. 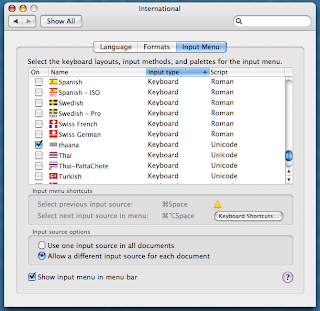 Then move it to Keyboard Layouts folder within /Library or ~/Library; then they are enabled via the Input tab of the International module within System Preferences. 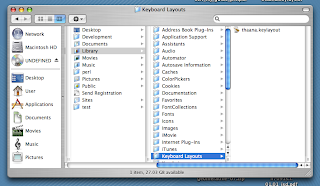 If you don't have the Keyboard Layouts folder under the Library, create it. Thats all, the keyboard layout is complete and ready to be used. 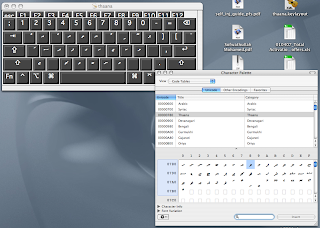 The end result is ..... but before that make sure you change your keyboard layout... if all went well you should get the thaana layout. Click on it, and you are ready ... Happy?